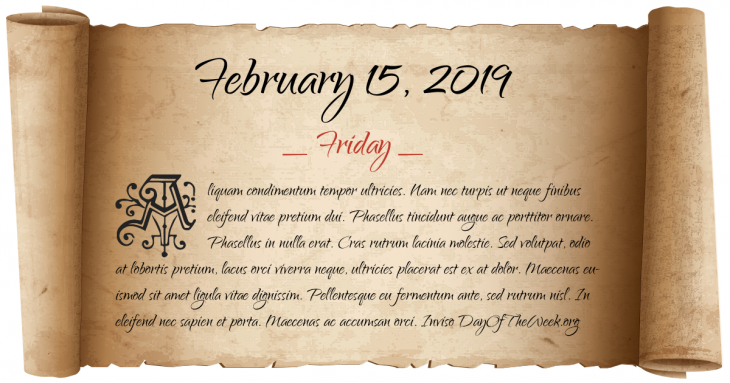 What Day Of The Week Was February 15? A new red-and-white maple leaf design is adopted as the flag of Canada, replacing the old Canadian Red Ensign banner. José María Velasco Ibarra, serving as President of Ecuador for the fifth time, is overthrown by the military for the fourth time. Soviet Union invasion of Afghanistan: The Soviet Union officially announces that all of its troops have left Afghanistan. First draft of the complete human genome is published in Nature. Who were born on February 15?